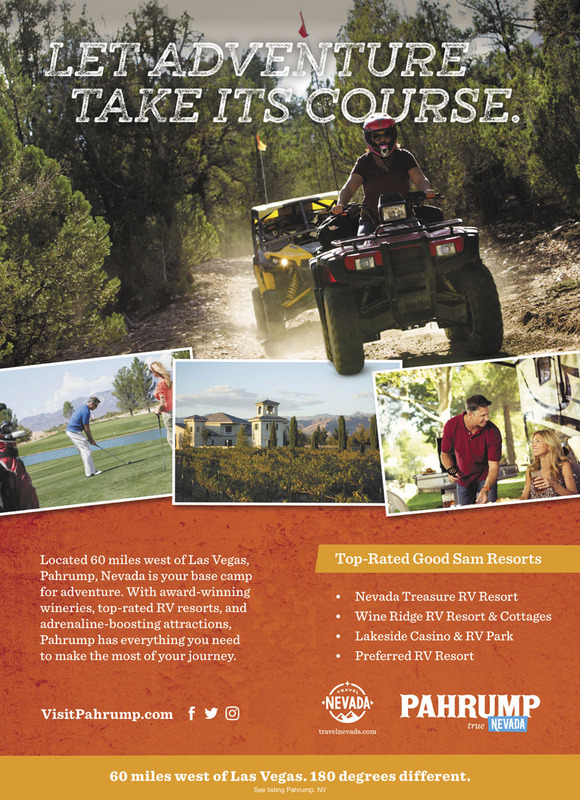 Great park with good amenities (multi-level pool, bowling alley, and onsite grill and bar ). The sites were level and the connections were reliable. The park is well maintained, and the staff were very pleasant and helpful. This is where we will return when we come out this way. Please take this as constructive criticism, you need to know. We made a reservation at this location based upon ratings and pictures. I've never been so mislead in my life. At check in the young man behind the counter didn't seem comfortable and needed direction. Proceeds to tell me they can't give me a discount since we made a reservation online. Sorry, its the 21st century. At the office it didn't look that bad but on the way to our spot, didn't look like any maintenance and or landscaping was done in over a month. Couldn't make turns in a Class A without having trees rubbing down the coach. Now the site which was a Mega Lot (and the 2 vacant next to me) that we stayed at was a mess. Like I mentioned earlier I don't think it was maintained or cleaned in over a month. Really? You have someone that reserved this lot months in advance and you do nothing?? Everything mentioned about the site was either not accessible because of spider webs or overgrown vegetation, didn't work or was dilapidated. Sorry for the bad review but I feel you need to know and others considering this location need to know too since the current Good Sam rating is not accurate at all in my opinion (The other 6 resorts we stayed at on this trip regarding Good Sam ratings were dead on, not this one). We needed a place to stay for a month and Pahrump was the closest Nevada town to SoCal. All the sites are back in but the pleasant and available ground staff backed us into our site with expertise and made the whole process stress free. There are a small number of long term inhabitants who add a friendly atmosphere. The staff was most obliging and friendly. 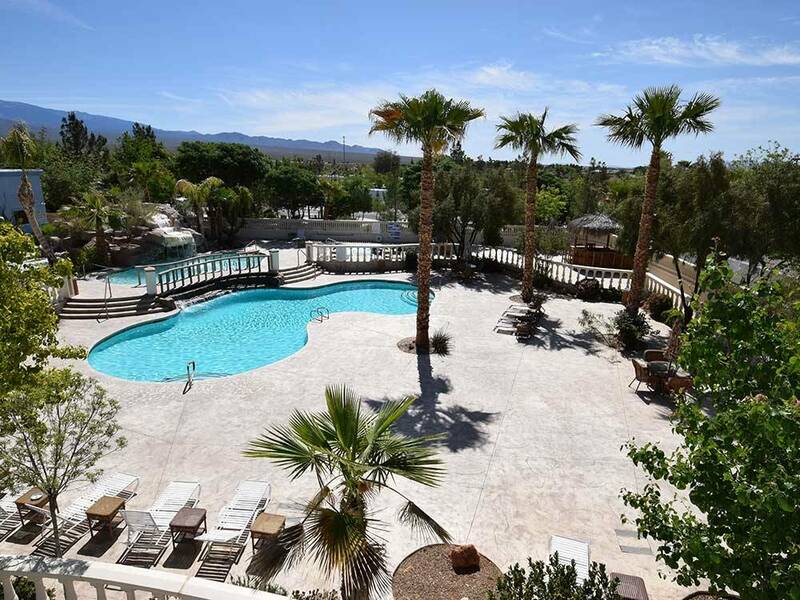 Facilities include a small restaurant and bar with ubiquitous slots, bowling alley, 3 pools, workout room, laundry room, all very clean and well maintained. We didn't use the restrooms so can't rate them.The trees and vegetation cover somewhat the fact that this is desert. Were it not for the fact that it is located10 miles north of town, I would give it 5 stars. That can be a benefit too. We could frequently hear a band of wild donkeys during our nightly walks with our dog. The site is completely walled with guest operated entry/exit security gates, which are closed at night. We were on the road and was staying only one night in our Class A with towed vehicle. This park has no pull through sites, it is set up very nicely for stay awhile back-in type RVing. They did accommodate us by letting us pull across two sites. It was very Hot, and the pool was very nice for a cooling swim late in the day.